The Crimea-born player, who finished just behind Viswanathan Anand in the 2014 Candidates tournament, is convinced that greater achievements loom in the horizon. Sergey Karyakin, the 24-year-old Russian grandmaster born in Simferopol, entered the Guinness Book of World Records at the age of 12. At the 2014 Candidates tournament, which was held in Khanty-Mansiysk, he finished in second place behind former world champion Viswanathan Anand. Karyakin can now regard himself as the third best chess player in the world, behind world champion Magnus Carlsen and Anand. Karyakin’s professional growth slowed down for a while, when he, while still a citizen of Ukraine, was faced with the lack of qualified teachers. 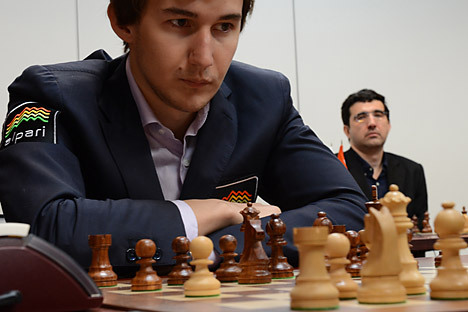 Already the winner of the 2009 World Chess Olympiad as a part of the Ukrainian team, Karyakin obtained Russian citizenship and moved to Moscow. Shortly after this event Karyakin’s marriage with Ukrainian chess player Catherine Dolzhikova fell apart. He now has a girlfriend named Galia, who he met at one of his tournaments. Galia is responsible for the grandmaster’s personal site and she is also a professional photographer. After moving to Russia, Karyakin’s results went straight uphill. He became the winner of several competitions of the highest category and in 2012 he won the world title in speed chess. About two years ago, Karyakin concluded a long-term sponsorship agreement with Alpari and hired a personal manager. In May 2013, Karyakin had one of his major victories, winning the super tournament in Stavanger, Norway, which included the ten best players of the world. The Russian grandmaster beat Carlsen, his main rival and host of the competition by just half a point. Six months later Carlsen, the Russian’s peer won the World Championship, beating Anand. Despite Karyakin’s many wins in different super tournaments, chess analysts believed that he was not yet ready to fight for the chess crown. But in Khanty-Mansiysk, the Russian made all the scepticism dissolve. Although he started the tournament on a bad note dropping to second to last place, Karyakin managed to win several times in the second round and eventually finished the competition in second place.